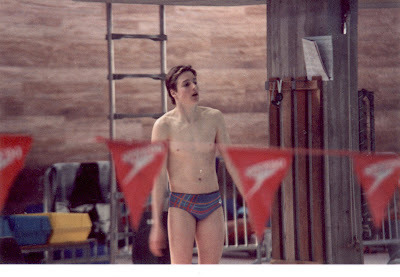 Since I've been talking about swimming this week, here I am in 1984 at Geneve Natation 1885. Note my groovy trunks - no rubber there. This BTW le Piscine de Vernets, a wonderful nine lane, 50-meter indoor pool whose surrounding made of marble. Outside, a separate 25-meter pool and ten meter diving platform which I refused to master. Since Switzerland, the deck spotless and locker rooms organised around a clean, open and orderly changing area complete with body-dryers and separate changing rooms for the athletes. Why can't every pool be such? Today the first work day of August and boy, it is dead. The Nordics start their summer first taking off all of July. The rest of Europe follows in August and London's population, I read somewhere, drops 15%. Traffic suggests this to be true. Calls are also way down and today I barely have an email. No scandals in the news. Even the Thames seems to take a lazy turn now that we are outside the high lunar tides. I don't complain, mind you - there are plenty of things to do like web searches or buying a house. The kids, for there part, bonkers from boredom. At one point this morning I spot Eitan lying on the floor, face-planted into a pillow. Today begins football-camp which keeps the mopes occupied for six hours, God bless. I drop the Shakespeares off and wave good-bye. Yes, August a cruel month if you are, like, the only family in Richmond not going on hols.